SUMMER = sun, outdoors, BBQ, and LAWN! Its the time of year to gather in the backyard with family & friends, enjoying a game of cricket & a few beers. So you’ll need to keep your ‘pitch’ in tip top shape & looking its best. This is very easy with Sir Walter DNA Certified Buffalo Lawn, especially if you keep these handy tips in mind. Try not to mow your Sir Walter buffalo lawn too short. Keeping a bit of length on the leaf blade will actually keep your lawn in much better shape. A lot of people think if they cut their lawn lower it will be easier to take care of. But this is far from the truth, quite the opposite actually! Shorter lawns need a lot more watering as the soil is more exposed. Keeping a bit of length on the leaf shades the soil, keeps it cooler & much less exposed for evaporation. So resist the temptation to go gung-ho with the mower, raise your height to at least 40mm and let it breath a little. Another tip is to make sure you never mow more than 1/3 of the leaf tip off in any single mowing. 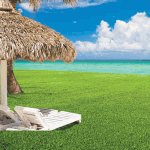 Your lawn wont like it & will go into stress when it will seed & become thin & patchy. If you need to mow more than 1/3, like after you’ve been on holidays, do it in a couple of goes over a few consecutive days taking a little off at a time. The end result will be far better. 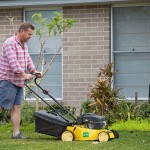 Ever wondered why sometimes your lawn looks ‘white’ after mowing? Well the answer is simple.. your mower blades need sharpening! When the blades are blunt they tend to ‘tear’ the blades rather than cut them. Not only do sharper blades give a better finish, they also make mowing easier! 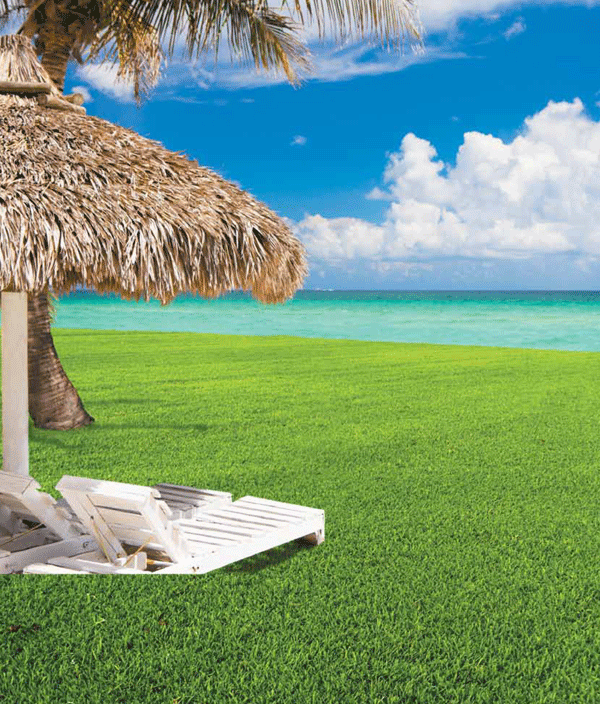 Applying fertiliser early in the summer season is recommended to boost your lawn through the hotter months. 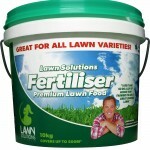 Apply a good granular slow release fertiliser such as the Lawn Solutions Australia Premium Fertiliser which has high levels of nitrogen for good growth & colour, phosphorous for strong root growth and potassium for metabolism & respiration, plus all the trace elements you lawn needs to stay strong & healthy. Apply the fertiliser at the recommended rate, but in one section of the lawn in the space of roughly 1m x 1m, apply twice the amount. If in a few weeks time this area has better colour & performing a lot better than the rest of your lawn, fertilise again at the recommended rate. Sometimes your lawn may just need an extra boost, especially if there have been periods of high rainfall which can leech all of the nutrients out of your soil. Ideally during the summer months, watering for at least 1 hour once per week should be sufficient to stand up to even the hottest summers day. By watering deeply & infrequently you’ll be encouraging stronger, deeper root growth which will increase the drought tolerance of your lawn. For your watering to be the most efficient it can be, you should apply a wetting agent to increase your soil’s water absorbency, especially on sandy soils, and to ensure that your soil isn’t ‘hydrophobic’ and repelling water. Simply applying a product such as Lawn Lovers Lawn Soaker, you can easily treat your soil just by clipping the bottle onto the hose & spraying it over your entire lawn. Over summer, ideally your lawn will be growing in a tight thick mat which will mean those pesky weeds just wont be able to compete. 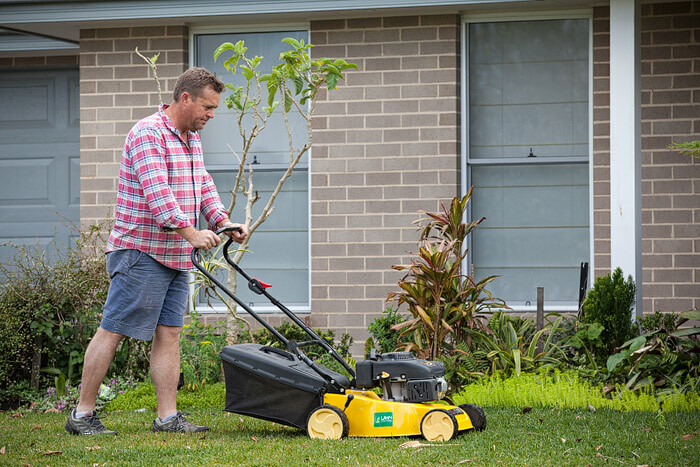 However if your lawn did cop a bit of a battering over winter & a few weeds managed to get in & are still hanging around, giving them a hit of Lawn Solutions Australia All Purpose Weed Control will mean their days are numbered. We also highly recommend Bin-Die Selective Weeder and Winter Grass Killer, both safe to use on most lawns, including Sir Water Soft Leaf Buffalo Lawn. Now you’ve got your lawn sorted all you need to do is grab some beers & snags, your cricket bat & ball, and invite over your family & friends, and you have everything you need for a summer of fun!